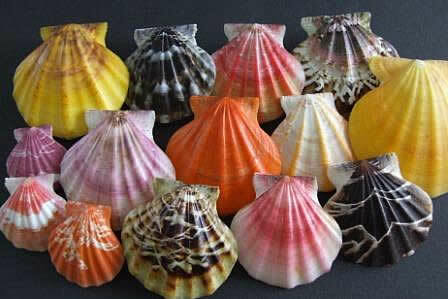 Pecten shells or scallops are among the most popular group of molluscs for seashell collectors because of their wide variety of forms and colors. There are nearly 500 different recent species known, divided in 4 families. They all conform to the general pattern of 2 valves with an almost round outline, ribs radiating like a Roman comb and two ears on each side of the shell. The goal of this website is to help everyone interested in this family to identify their treasures, providing some pictures of each species and mark their most important characters. This website follows the species list proposed by Henk H. Dijkstra, author of the website scallop.nl with a more scientific approach. I want to thank the following persons for their help: Mr. Henk H. Dijkstra, Mr. Philippe Poppe (Poppe-images), Mr. René Vanwalleghem, Mr. Stanley Francis and Mrs Evangeline Spafford.